Prehypertension is a heterogeneous condition, and the cardiovascular risk differs in relation to many clinical variables, such as age, blood pressure level, and associated risk factors. Among these, resting heart rate has emerged as a novel cardiovascular risk factor. General population and cohort studies have shown that heart rate plays an important role on the progression to hypertension in subjects with prehypertension. A positive association between heart rate and adverse outcome has been found in several studies of people with prehypertension. In the ARIC study, participants with elevated heart rate had 50% higher all-cause mortality than people with lower heart rate. The Kangwha County study has shown that individuals with coexisting elevated heart rate and high blood pressure, even in prehypertensive range, have an increased risk of all-cause and cardiovascular mortality. 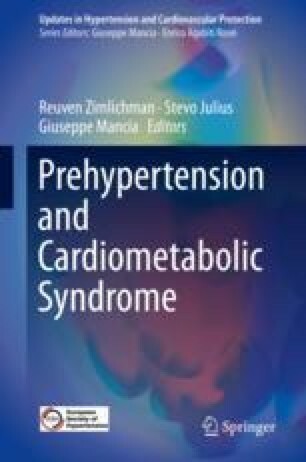 Experimental studies have shown that tachycardia in prehypertension is due to an abnormal autonomic nervous control of a normal pacemaker suggesting that patients with prehypertension have an increased sympathetic and a decreased vagal tone. The low shear stress and the increased tensile stress generated by tachycardia favor the development of atherosclerotic plaques and increase the stiffness of large blood vessels as shown by studies in the experimental animal and human beings. In people with autonomic dysfunction characterized by sympathetic predominance, rather than to merely reduce elevated heart rate and high blood pressure, it would be more rationale to restore a normal sympatho-vagal balance, a goal that can be achieved by improving subjects’ lifestyle. Several non-pharmacological interventions have been advocated in people with prehypertension. Besides reducing the consumption of tobacco, alcohol, and caffeinated beverages, a program of regular physical activity should be implemented mainly based on aerobic activities. In symptomatic people with tachycardia, treatment with beta-1 selective blockers may also be considered.